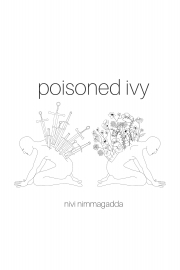 Poisoned Ivy is a collection of poems written by Nivi Nimmagadda, with everything from the pain to the strength and everything in between. Poisoned Ivy was inspired by many different people and many different experiences, all of it coming back to the fact that everyone goes through a point in their life when they feel worthless and they find it within them to keep fighting and that’s exactly what Poisoned Ivy represents. Poisoned Ivy is a journey about the pain that we go through in trying to find and accept ourselves, the heartache of losing people along the way, the love for yourself and the world around you, and the strength in finally embracing yourself, letting go of the hatred, and taking pride in who you are. Nivi Nimmagadda is the 16-year-old author of Poisoned Ivy and a proud connoisseur of Cheetos and Cinnabon. She was born and brought up in Boston, Massachusetts and moved to Bangalore when she was just 11. The change in environments and societies she experienced have played a major role in her writing today. Nivi was always caught up in books from the day she learned to read. Going to the library meant coming back with at least ten new books, but writing was a recent endeavor for her. Nivi didn’t start writing until about a year ago and she hasn’t stopped a day since then. A lot of her poems come from not only her personal experiences but also from the pain, heartache, love, and strength of others. She uses writing as a medium to express her innermost thoughts but more so to help others understand that they are not alone. I am one of those gardeners who gets a poison ivy or oak, even sumac, every single time I venture out in the garden. I think I have those nasty vines everywhere on my property and just didn't realize what they were. This is the ONLY product that works for me. I always use it to wash up after a stint in the garden, but when I have a full blown rash, this stuff gives me relief for a few hours. I am extremely sensitive to the rash, and I even scratch holes in my skin. So, other than amputation, I think this product is the best and I will never go without in my lifetime. I always keep a backup tube.Oh and they make a spray too, which works great.